"U.S. Citizenship and Immigration Services administers the nation's lawful immigration system, safeguarding its integrity and promise by efficiently and fairly adjudicating requests for immigration benefits while protecting Americans, securing the homeland, and honoring our values." "USCIS secures America's promise as a nation of immigrants by providing accurate and useful information to our customers, granting immigration and citizenship benefits, promoting an awareness and understanding of citizenship, and ensuring the integrity of our immigration system." The removal of the phrase "nation of immigrants" was announced to agency staff in an email letter from Director L. Francis Cissna. In the letter, Cissna said, "I believe this simple, straightforward statement clearly defines the agency's role in our country's lawful immigration system and the commitment we have to the American people." He also explained why the new mission statement deletes the reference to agency applicants as "customers." "What we do at USCIS is so important to our nation, so meaningful to the applicants and petitioners, and the nature of the work is often so complicated, that we should never allow our work to be regarded as a mere production line or even described in business or commercial terms. In particular, referring to applicants and petitioners for immigration benefits, and the beneficiaries of such applications and petitions, as "customers" promotes an institutional culture that emphasizes the ultimate satisfaction of applicants and petitioners, rather than the correct adjudication of such applications and petitions according to the law. Use of the term leads to the erroneous belief that applicants and petitioners, rather than the American people, are whom we ultimately serve." Ending the use of the word "customer," writes Cissna, is "a reminder that we are always working for the American people." Cissna did not explain his rationale for dropping the words "America's promise as a nation of immigrants." Cissna was sworn in as the agency's director in October 2017. He had been the director of immigration policy with the Department of Homeland Security's Office of Policy. "Our nation is one built by immigrants—removing this language does nothing to change that fact, it only reveals the insidious racism harbored by those in this administration. It is clear from the language and policies put forth by President Trump and his hard-line immigration extremists that they will stop at nothing to demonize and dehumanize immigrants and refugees, who have often fled violence and persecution in search for a better life for themselves and their children." 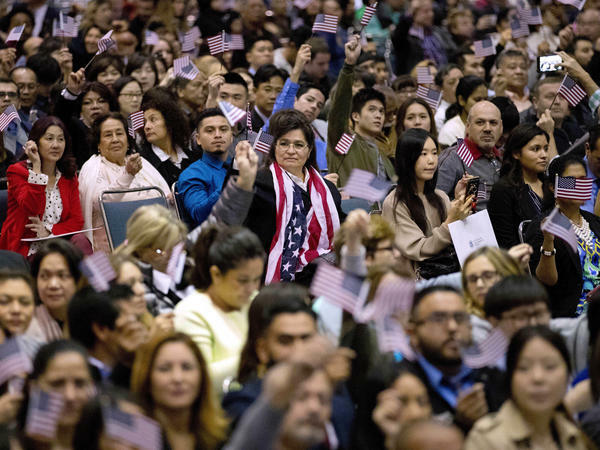 USCIS officials say the new mission statement reflects Cissna's focus on "fairness, lawfulness, efficiency, as well as protecting American workers and safeguarding the homeland."